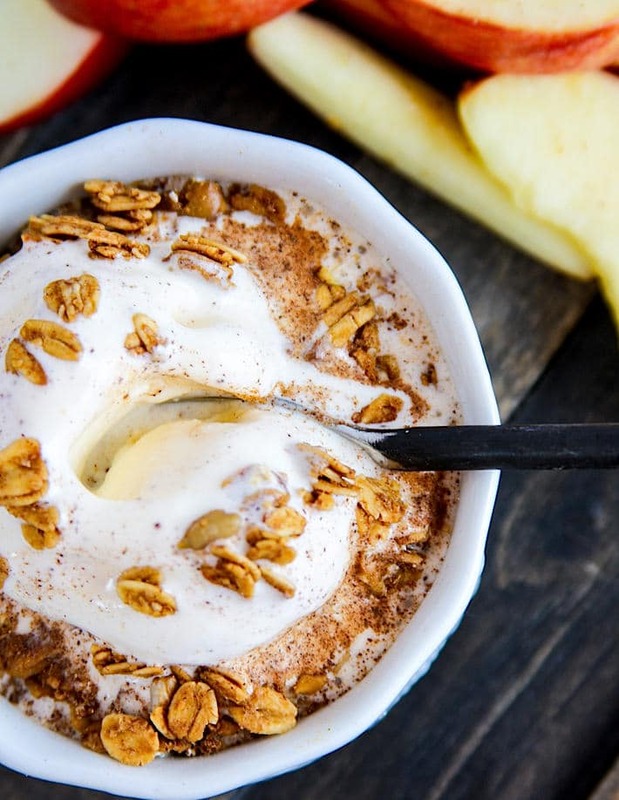 Healthy Spiced Apple Cider Crumble! 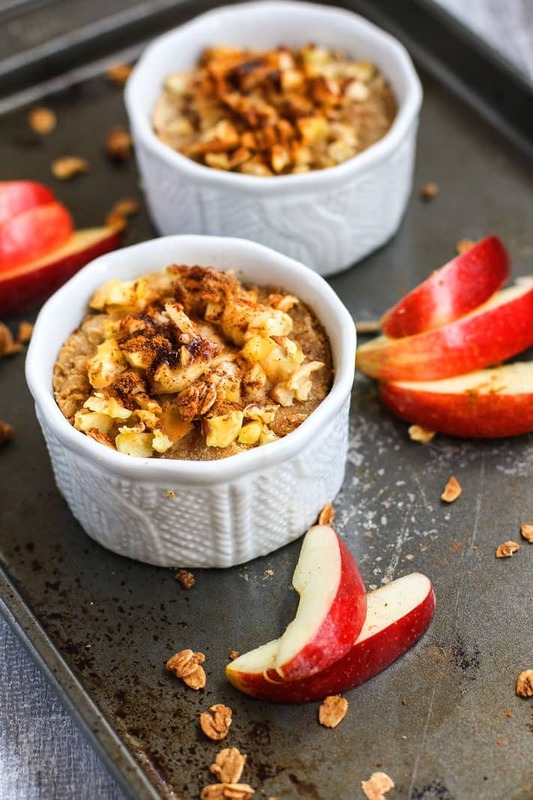 A gluten free dessert (or breakfast) made with Apple Cider vinegar, apples, spiced, and more! 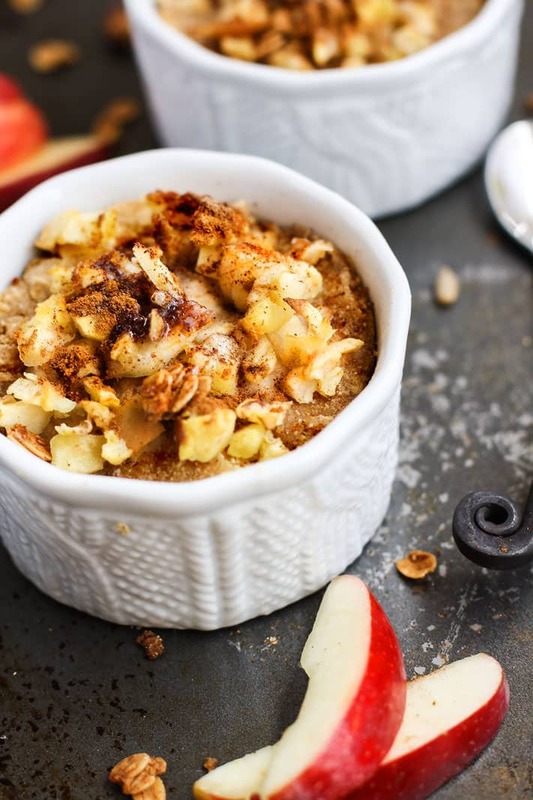 This Spiced Apple Cider Crumble is Gluten free, dairy free, and paleo friendly! A single serve crumble bake that’s actually good for your immunity and digestion, really! Read why below! Plus it’s easy to make and delicious a la mode. Make one or multiple at a time! Can we make Friday’s confession days? Just say yes. Because today I have a confession… or two, or, three. Confession number one. Ever since my husband retired from triathlon (in March), talking about health and nutrition has been hard. It’s weird to shift focus from HIS training and what I’m feeding him, to what’s WE’RE going through and what recipes, foods, nutrition are working for US. Adding my nutritional needs into this mix. That feels weird. 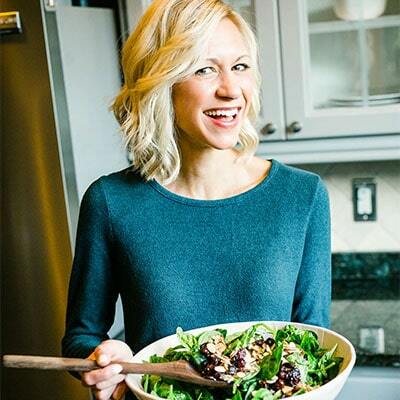 Confession number two: Speaking of nutrition, I’m so used to paying attention to my husband’s or my client’s health that I totally forgot about mine. And I now I’m paying EXTRA attention to it. Gut health and stress reducing life choices! Talk the talk, walk the walk, right? Confession number three: I wouldn’t have changed any of these situations. In fact, it has made me get more creative in the kitchen and forced me to shift perspective. In a good way! It has also made me realize how important it is to not focus SOLELY on diet to keep you healthy. Honestly, stress and negative thinking can do more damage. Ha, was that confession number 4? I think so. So.. now that, that’s off my chest. 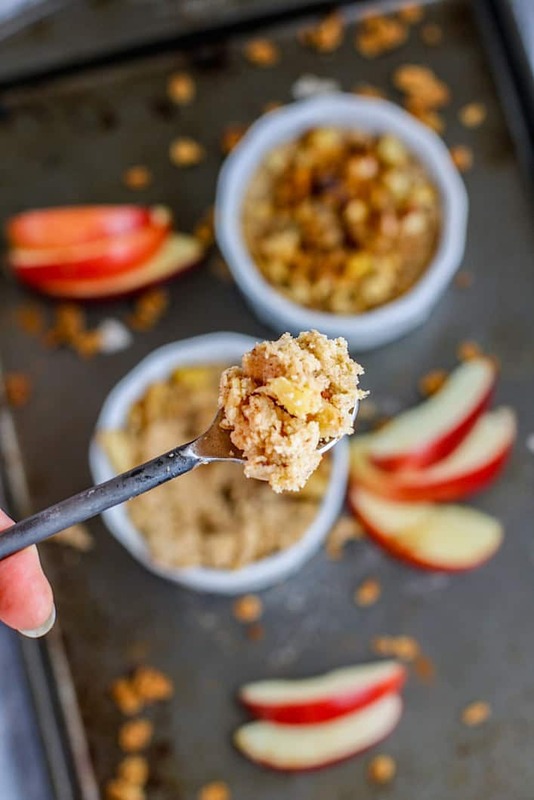 Today’s Spiced Apple Cider Crumble recipe has gut health benefits combined with healthy comfort food. See, I told you I was about revamping favorite comfort food dishes. I made a cake similar to this apple cider crumble years back, and I couldn’t wait to bring it back alive. But in a whole new way! Individual bakes! So yes, it’s a single serve bake, but actually serves 6. Whoops, the more the merrier, yes? The recipe is changed but still has one very IMPORTANT ingredient. APPLE CIDER VINEGAR –> LIKE WHOA! Apple cider vinegar is a fermented product made from crushed and aged apples, it’s a lifesaver when it comes to gut health and immunity. Here’s some reasons to like Apple cider vinegar. Actually here’s some reasons just to drink it, you might not like it at all but you should still drink it! The healthiest versions contain “the mother” (kind of like a kombucha mother scoby) which is a colony of beneficial bacteria. Helps ease heartburn and acid reflux. THEREFORE —> a daily consumption of ACV can help! P.S I added more SPICE to the mix because apple spice (cinnamon, ginger, nutmeg, etc) also aid in digestion and have anti-inflammatory properties! 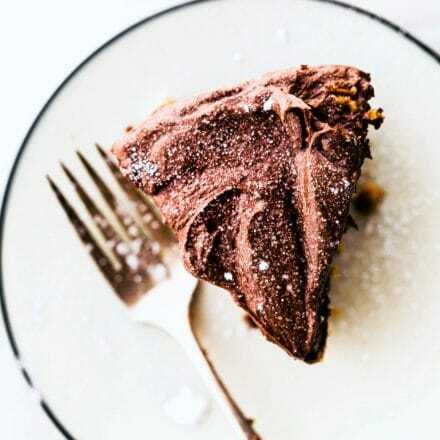 Yes, this dessert or breakfast or whatever you call it is a WINNER! Okay, now that you know why it’s so good for you, let’s put it in a recipe. Here’s my Spiced Apple cider Crumble, single serve but feel free to share or eat 2 servings at a time. I won’t tell! Haha! 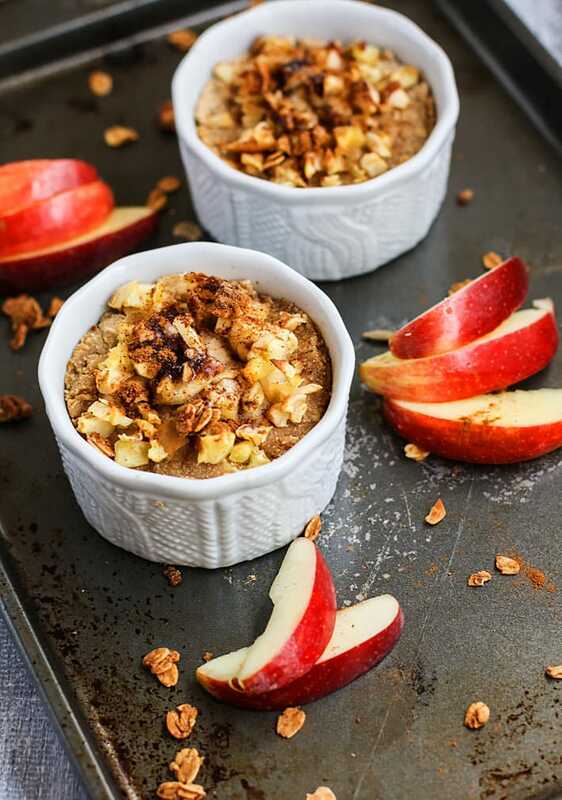 Healthy Spiced Apple Cider Crumble! Made with Apple Cider vinegar, apples, spiced, and more! 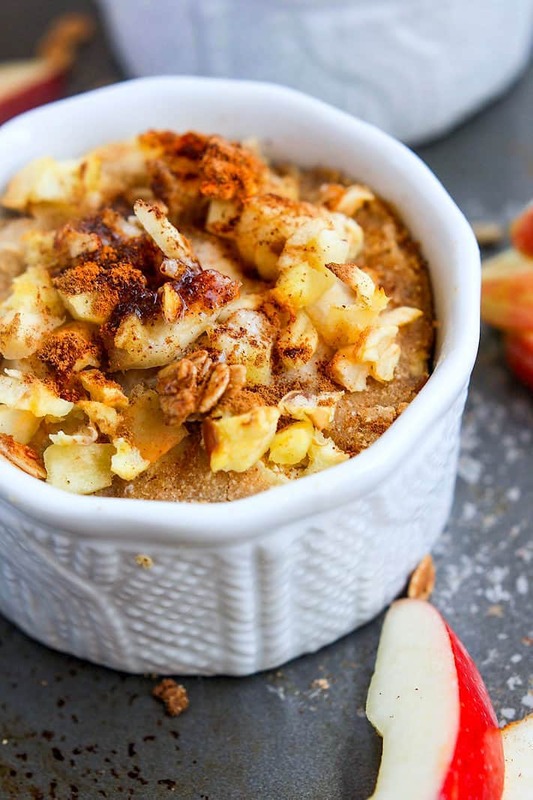 This Spiced Apple Cider Crumble is Gluten free, dairy free, and paleo friendly! 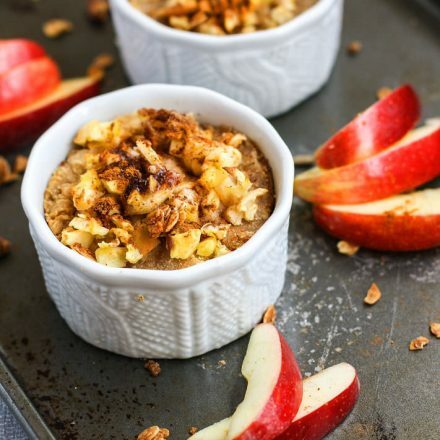 A single serve baked dessert or breakfast that’s actually good for your Health! Plus they are easy to make and delicious a la mode. Make one or multiple at a time! In a large bowl, Mix your flour and dry ingredients first. Set aside. Whisk your egg and milk then fold in the Grain free flours. Add the applesauce, Apple cider vinegar, vanilla, and apple and mix again. scoop batter into greased 5-6 6oz sized ramekin until they are about 3/4 way full. In a small bowl, mix 1-2 tbsp melted butter and 2 tsp coconut sugar. Place 2 tbsp of additional chopped apple on each ramekin. drizzle butter/sugar mix over each ramekin. Place all int he oven for 15 to 20 minutes or until top is browned and flour is baked in center. Let cool and add nuts, granola, or vanilla yogurt or ice cream if you’d like. If you want it to be sweeter, add in honey or baking stevia. you can use coconut butter vs real butter. If you want it more sweet, drizzle honey on top. Pea Protein plus one more egg white works in place of coconut flour if you want it more fluffy! Don’t have ramekins? You can use a baking pan and bake it all at one. But might need to add more topping and check the cooking times. for cassava flour- we use ottos naturals. This thick cakey crumble is of course it’s gluten-free with a paleo/grain free option. A tart yet buttery spiced taste! 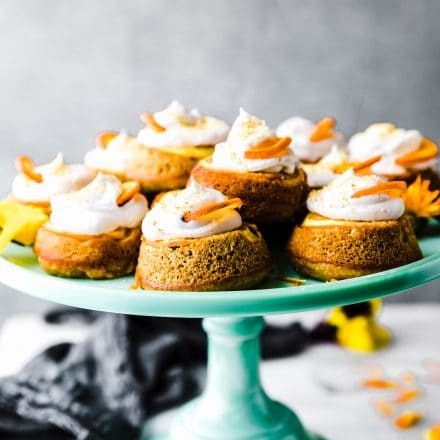 That screams Fall dessert, right? And if you are wanting to make this Spiced Apple Cider Crumble a tad more rich, just add coconut or real cream ice cream. Because life a la mode is stress free and therefore good for you! That’s my justification, always! Okay, last confession. You can easily make this in a cake form and forgo the ramekins. Gah, my secret is out! Do you use Apple Cider Vinegar? I know most either love it or hate it! Haha! Looks like a delicious winner to me! I am all for making confessions, especially if you can learn and grow from them, which it seems that’s exactly what you are doing. My fav apple dessert is not that creative, I have always had a love affair with apple crisp, which is why I know I will love this recipe. I can relate to your confessions in the sense that when I’m not working toward a training goal it feels strange to focus on my own health! I transfer is to my kids, I guess our personalities are comfortable taking care of people! Also agree negative thinking is killer, and I battle with that all the time. 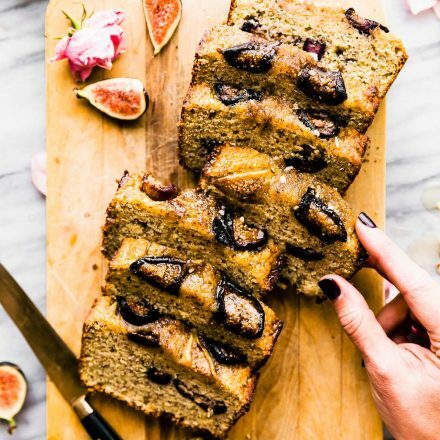 On a happy note, this recipe, and the photos, look perfect and I want this for breakfast now! it’s the nurture side of us. But at least we have each other to remind us to nurture our own health! <3 right? well I think I’d prefer your stewed apples! ya, one big crumble is DANGEROUS! I love ACV. I put it in my oats, all of my baking, and so on. But what I want to say is that I’m glad you are taking some time to concentrate on “me” as well as “we” and not just “him” or “them.” About damn time! 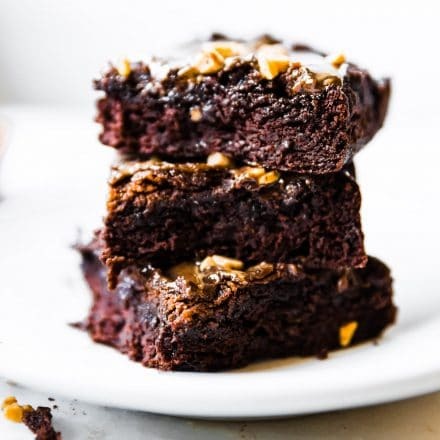 Confession: I am seriously impressed by the amount of creative recipes you are posting each week. haha well… i do like feeding people. Come visit! I can imagine what a shift it has been for you these last months. It’s easy to overlook our own health and make something else the priority. I sure do know that but it’s important to take care of ourselves first and foremost. Cheers to taking care of you friend! Now hand me a spoon so I can devour this! pinch me im dreaming! this is actually heaven! ohmygoodness, I need this in my life!! We have so many apples in our house. I’m going to make this this weekend! let me know what flour you use! i think oat flour would too! haha you are so observant and i love it! We use ACV a good deal in our household. So I’m always up for new ways to use it, especially if it’s a fantastically yummy looking dessert! And also, this looks so so good. I love apple recipes in the fall and winter! This sounds heavenly! I am a big fan of apples in the fall. I love almost all things apple, but I’ve been craving homemade apple sauce for days! Sooooo much easier to just tell other people what to do, right? Meh. This looks so good. I want to eat all of it now that the temperatures are dropping in Chicago. There’s a freeze warning tonight! As always, this recipe looks amazing – and so do your photos! I love apple crisps and crumbles so much this time of year. And good for you for taking care of yourself! I used to drink ACV all the time in grad school to keep my immunity up (teaching college students and sharing a small office with 20 grad students=oh so many germs). I need to start that habit back up, so thank you for the reminder! oh man, i bet you needed all the immunity you could get! Drink up! haha. Cannot wait to try this! Your pictures are absolutely gorgeous! Girl you are killing it in the kitchen! These look amazing! If only I had enough time to make all the things my heart desires… These would be so perfect as I need comfort food right now. It’s cold (37 right now here) and we have had two hard days of memorials and another tomorrow and if my mom had everything here at her house to make these I would stay up tonight and make them. OH and yes I’m an apple cider vinegar fan! Actually I was going to make my own but didn’t have the screens and went to get them and questioned the peels when I got back so I didn’t but my dad has some going he made and we are going to test it tomorrow! oh friend, i am here for you! You are one amazing wife, mom, and daughter. know that! Love that you’re taking care of you, because YOU deserve it <3 I definitely know how difficult it can be to shift more of our focus on ourselves, though — I struggle with the same kind of thing. 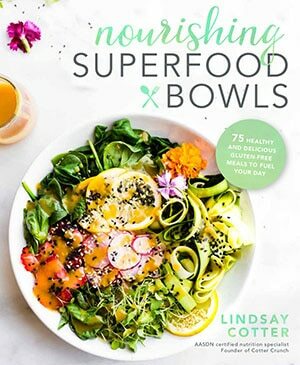 I rather enjoy Friday confession posts and I think factoring in you and your own nutritional needs into your recipes is a welcome and refreshing sight. It’s super important to put yourself first because if you don’t have your stuff together, it’s awful hard to take care of someone else. I’ve also found over the years in relationships, one person tends to be strong for the other. When that other person gets their strength, the person propping them up tends to suddenly suffer because it’s their turn to be nurtured as opposed to the one doing the nurturing. It’s a weird cosmic balance thing in relationships. At least that’s my take on it. thanks friend, i know you get this. and i so love your honesty and encouragement. It’s so true! Diet and nutrition plays an ENORMOUS part in our overall well-being, but I definitely feel the healthiest when I’m getting enough sleep and am not stressed. Also – love ACV. It’s got great probiotics benefits AND the health benefits of vinegar, so win/win! I have apple cider vinegar and it has been sitting there unopened because I didn’t know where to start with it. This looks so good! This reminds me of the apple crumble pie I made last week, but even better. I’m not a fan of making pastry/crust so this seems like a much easier and individual-sized is great for portion control. confession: I rarely cook with apple cider vinegar or use it but you have convinced me I need to! This sounds delish and I loooove apples and an apple ‘bake’ sounds perfect. Much love my friend, always in my prayers. OH man,i’m sorry! tell Dave I can relate! Is he on digestive enzymes?